Implementation of damage tolerance requires the characterization of nondestructive evaluation (NDE) capabilities in terms of the probability of detection as a function of flaw size. Quantification of NDE procedures is essential to provide both a confidence level in detection of required flaw sizes and in establishing periodic inspection / maintenance events as a function of part usage. Gas turbine engine components (aircraft engines) are highly loaded and critical the safe-life / operation of an engine. In general, detection of small flaws is required to provide the maximum mean time between inspection cycles and thus contribute to most economical engine operation. Reliable detection of small flaws in engine components has been demonstrated by precision eddy current inspection procedures. The procedures were implemented using a precision robotics scanner and various eddy current probes and scanning sequences. The eddy current system elements were integrated into scanning sequences to provide a quantitative, fully automated inspection of critical areas of engine components. The integrated system is identified as the RFC (Retirement for Cause) system and has been extensively applied to the inspection of rotating gas turbine engine components throughout the world. Since the introduction of the system in 1979, additional engine components and inspection features have been added to provide support of various engines and to extend the life of aging components. The most recent system improvements have been an improved eddy current instrument, an improved robotics controller and added computing and electronic communications capabilities. This paper described the retirement for cause system management principles; the RFC eddy current system development and application; and the recent improvements to increase capabilities and reduce both system cost and system operating costs. In the Aircraft industry, there two predominant philosophies used to manage the life of engine components: The Conventional fatigue life design and the Damage Tolerance Approach (DTA). The first one, is based on the premise that all materials are free of initial defects. This philosophy makes no special allowance for material or in-process manufacturing anomalies or defects; it stipulates that components are designed to the Low Cycle Fatigue (LCF) minus 3 Sigma limit so they will exceed the required usage interval in terms of engine flight hours or cycles. Consequently, the NDE methods used for this approach are generally used as process control tools and require no detailed knowledge of detectable flaw sizes, nor of the Probability of Detection (POD) for a particular flaw size. 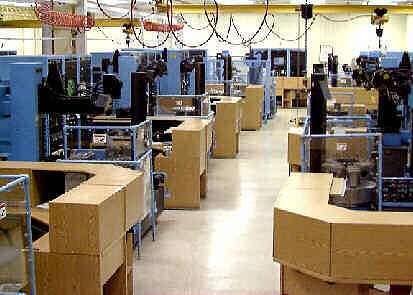 DTA assumes that damage, a flaw of minimum detectable size, is present within the component at all critical locations. DTA concepts are used in the Inspection Based Life Management Philosophy (IBLM) of critical components of certain engines. Examples of this philosophy are the ENSIP (Engine Structural Integrity Program), RFC (Retirement for Cause), and Life extension. These philosophies ensure that this flaw will not grow to critical size in two inspection intervals, forcing inspection at intervals of 1/2 average propagation life. These philosophies demand a rigorous approach to assessing NDE capability. Quantitative, and statistically based NDE capabilities results are needed and have to be generated for the NDE techniques on the materials for which these will be used. Flaw detection requirements for most engines is beyond the capability of manual NDE methods. Since surface connected flaws are of primary concern in most engines, The initial thrust was on NDE methods for surface connected flaws. Eddy current inspection was the primary NDE method and has now been supplemented by specialized methods and extended to subsurface flaws. A unique feature of system development has been the quantification of flaw detection capabilities and the use of detection capabilities as a basis for system development, system validation and system performance process control. Flaw size detection capabilities are expressed in terms of the POD, which is reported with two numbers, the calculated POD, and the Statistical Confidence Level associated with the calculation of that Probability. Early gas turbine engines has a very short operating life between overhaul / maintenance cycles. Both economic and operational readiness requirements have demanded and every increasing operating life (mean time between overhaul). Structural deficiencies were a primary cause of failure. Improvements in design, materials and maintenance practices greatly increased the operational life, but were limited by knowledge and methods for anticipating service induced initiation and growth of flaws. The advent and introduction of fatigue and fracture mechanics as design and life-cycle management tools offered substantial improvements in life predictions and substantial improvements in both safety and operational reliability. 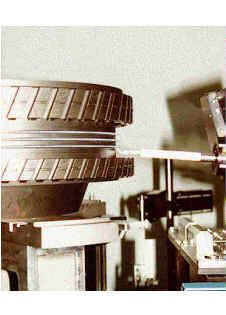 A key to implementation of fatigue and fracture mechanics was the development of quantitative inspection capabilities. In the United States, the USAF Material Lab (Man Tech Division) assembled a team of experts and funded a program to develop a state of the art inspection system In October of 1981. This system is known as, the Retirement For Cause system and was awarded to System Research Laboratories, Inc.(now VEDA Corporation). The initial program challenge was to reliably detect small (0.005 by 0.010 inch) cracks in parts that were being returned for overhaul or replacement. Without the inspection system, parts that had exceeded their 1,000 hour design life were retired to minimize the possibility of a catastrophic failure in flight. When confidence was gained with the new RFC inspection system, parts could be returned to service for an additional 1,000 hours and beyond with substantial savings in parts replacement. The RFC system was conceived as a fully automated inspection system that could be operated by mechanics in the engine overhaul facilities. Extensive sub component development and testing were completed to assure that the basic inspection capabilities could be met. The sub components were then integrated into the fully automated system and further system level testing and validation was completed before each inspection sequence (scan plan) was accepted for production application. These practices and disciplines have extended to all subsequent system versions and improvement packages. 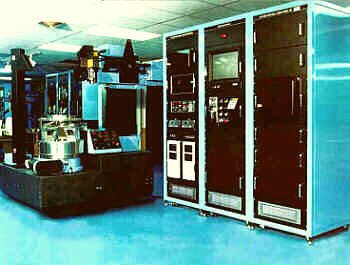 The resulting Retirement For Cause (RFC) Eddy Current Inspection System (ECIS) was a computer -controlled eddy current inspection station with standard communication interfaces, and extensive computer capability. Mechanical scanners provide a 7-axis automated scanning of complex engine part geometries; automated probe positioning and changing to enable inspection of multiple features; and set-up "calibration" reference artifacts for automated NDE set-up and diagnostics. The RFC system was originally applied to the USAF F-100 engine and provided cost savings that far exceeded the development costs. The system provided inspection of simple geometries (holes, radius areas, slots, etc.) in initial applications, but has been extended to complex geometries and part types. The flexibility in growth has been enabled by the precision of the system robot and by the addition of articulated probe assemblies. The success for the program has resulted in extension to other engines (both military and commercial) and the incorporation of improvements to implement new technology and improved system components. 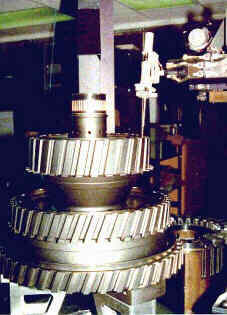 Figure 1., shows a Version 3 system with an engine disk in the inspection fixture. The system has been continually improved to implement new technology and to accommodate additional engine components and features. The common feature of all versions and operational sites has been independence from operator variations. In all systems, the operator load the component on the inspection fixture; enters the part identification (part number, etc.) and related maintenance service information; activates the system; and then visually monitors the progress to assure that "calibration" is completed in a reasonable time; probe damage; and general progression of the inspection task. When the inspection is complete, a report is printed out and the data up loaded into an archival database. Inspection malfunction is generally due to part preparation - cleanings, wear, etc. Experienced operators anticipate the system requirements and station parts that have been accepted by visual and dimensional inspection. Figures 2 and 3 show probe positioning on engine components. Figure 4 shows multiple RFC stations at an engine overhaul facility. Fig 2 and 3: Probe positions on engine components. Version 4 has been implemented to take advantage of new technology and system component improvements. It features an improved eddy current instrument; a new robotics controller and software; an upgraded station computer and upgraded system computer; and added engine feature inspection capabilities. The station hardware has been reduced to a single with a resulting increase in capability, increase in operating speed / through-put; and reduces system cost. All features and capabilities of previous versions have been retained. Figure 5 shows the elements of the Version 4 system and the inspection record out-put. On a single engine, $1 billion overhaul cost savings have been projected / realized for a 25:1 return on investment. The system has undergone continual improvement and upgrade to implement new technology; decrease system cost; and decrease operating cost. Systems have been implemented at various locations around the world and have increasing interest in both military and commercial applications. The system and technology implemented on the system is anticipated to be a continuing part of gas turbine engine life-cycle maintenance for high performance engines in future service.